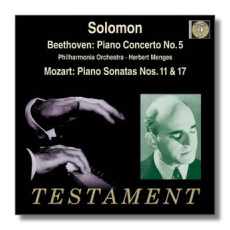 Solomon's legendary Beethoven concerto cycle has finally been reissued with aplomb by Testament, surely a document that remains amongst the annals of legendary performances. 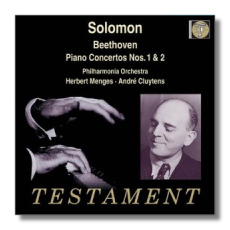 Some of the concertos were conducted by Herbert Menges and the others by André Cluytens, both friends of Solomon and understanding of his temperament to a hilt. Menges conducts thoughtfully and knowledgeably in the First Concerto which has a wonderful opening Allegro con brio in which Solomon's entry is as brief and uncharacteristic as to be almost unnoticed. The mercurial playing continues in the lovely Largo that is filled with a certain foreboding whilst the delightful Rondo' is carried away in tempestuous military triumph. Cluytens' view of the Second Concerto is much more direct and matter-of-fact and this also suits Solomon's carefree interpretation that comes out in a rather relaxed, almost laconic fashion especially in the pliant Adagio. The Third Concerto is also conducted by Menges and one almost marvels at Solomon's tempi dispatching the first movement in almost sixteen minutes, three minutes off the norm. The Rondo is especially wonderful here; indeed this view is only surpassed by Kempff and Van Kempen, at least in my opinion. The Fourth is a mercurial interpretation with Cluytens conducting the superb Philharmonia in one of their best performances ever. Solomon's playing is absolutely outstanding, both in the first movement and in that jolly finale in which the spirit of Beethoven's romanticism reaches full fore. Menges conducts the superbly trenchant 'Emperor', another seal on Solomon's authority as a brilliant pianist. A magnificent First Movement sails along with good humor and trenchant authority that matches Klemperer and Barenboim in full cry. Solomon also manages the lilting and lingering pause between the final movements with un-bedeviled tension; this is indeed assured mastery in pianism. Two Mozart sonatas accompany this masculine rendering of the 'Emperor', #11 and 17. Both are dispatched with loving care and affection especially in the genial slow movement of the latter. Recordings are not always brilliant but the mono sound is decidedly clear and pleasant on the ear with the early stereo sounding slightly disjointed at times. 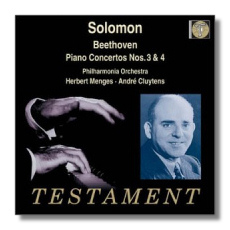 However, I'm sure Solomon fans will rush to have these three discs in their collection and newcomers to Beethoven would do well to have these recordings as a learned substitute to more modern versions.